2. Search for "potato salad"
3. Experiment with the recipe search tool that appears on the left. Most people are aware of Google Shopping – Google set up a way for merchants to list the details of things they have for sale. More recently, Google published a way to mark up recipes so that the search engine can tell what's the title, what are the ingredients, what's a photo of the recipe and so forth. We call this, "metadata" or data about the data. Get ready for a lot more of this kind of thing. The developers of, Bing, Google, Yahoo! and Yandex have cooperated on a common metadata vocabulary at Schema.org. It's a perfect example of coopetition – the search engines are cooperating how metadata should be embedded in web pages. That way webmasters don't have to code four different kinds of metadata. Meanwhile, the search providers will compete on what they do with that metadata. The results of this are already emerging, try searching for a movie title, for example, or for a type of restaurant. Any of the major search engines will give you a nicely structured result. We wanted to do the same for learning resources – videos, exercises, simulations, learning games and so forth. Wouldn't it be great if a teacher or student could search for "fractions" and get a search tool that allows the results to be filtered by age, grade level, subject or learning objective? Conveniently, the Schema.org folks had expressed their interest in new submissions, so long as they represent an industry consortium. So, a bunch of organizations got together and launched LRMI. You can learn much more about the co-sponsors, advisory groups and the specification itself on LRMI website. Schema.org embeds the metadata right in the webpage (using HTML microdata). That makes sense for search engines, but it means that only the publisher of the webpage can post metadata about it. Yes, there's such a thing as third-party microdata but the search engines don't pay attention to it. Plus there are other kinds of data that need to be shared between learning solutions. Conveniently, there's a complementary alternative. "CCSS.Math.Content.K.CC.A.1" is a "Learning Objective" defined as "Count to 100 by ones and by tens." "http://www.youtube.com/watch?v=rG_uUws1oC0" is a "Video" that "Teaches" learning objective "CCSS.Math.Content.K.CC.A.1" and is targeted at "ages 2-4". The first of these is one of the common-core standards. That data is now available in XML form on the web. The second of these is an LRMI statement. Of course, both are plain-English renditions of what could be machine-formatted. LR assertions also include their provenance, that is the name of the organization making the assertion, when the assertion was made and a digital signature. This lets users of the LR have confidence in the origin of statements and filter for reliable sources. 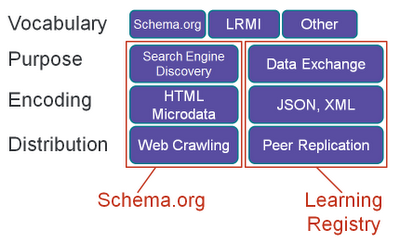 You'll see that "Schema.org" appears twice in the diagram. That's because Schema.org defines both a vocabulary (a set of metadata tags) and a way of sharing that metadata. LRMI is an addition to the Schema.org vocabulary that enhances descriptions of educational content. 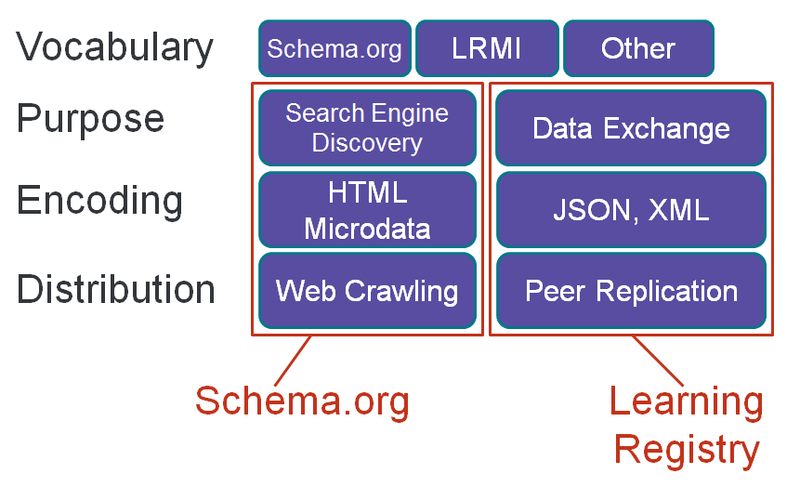 Schema.org and the Learning Registry offer two complementary ways of distributing metadata. They can even be bridged – there are experimental web crawlers that will extract HTML microdata from a page and inject it as assertions into the Learning Registry. Recording of last Monday's SIIA webinar on LRMI. Video explaining the value of LRMI. Schema.org blog post regarding pending incorporation of LRMI. Shared Learning Collaborative metadata efforts.